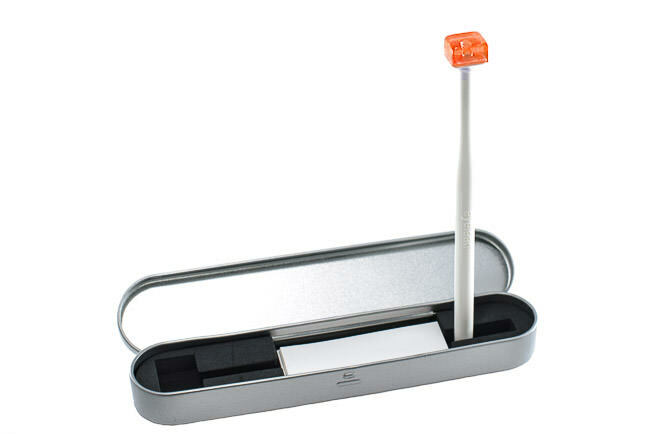 Sensor Gel Stick (Sony version) for cleaning digital sensors. Will work with Sony SLT and mirrorless cameras. One of the best solutions for keeping your Sony and Fuji digital camera sensors clean! This sensor gel stick is designed specifically for Sony SLT and Alpha mirrorless cameras, but will also work equally well on Fuji mirrorless cameras. All you have to do is gently “walk” the whole sensor with the gelled side of the stick. After a single pass, use the adhesive paper (included inside the metal case) to remove the dust from the gel. Simply expose the sticky side of the paper, set it on a firm surface, then hold it with your fingers, while firmly pressing the gel on top of the adhesive surface. The gel should stick, but it will be easy to remove. Once cleaned, the gel can be reused over and over again (see maintenance tips below). Repeat this process as many times as necessary to clean your sensor. Once done, turn off the camera, mount your lens, set it to the smallest aperture like f/32, then take a picture of a white surface. When you analyze the image, there should be no spots left. This particular product is used professionally by many service centers, including Leica’s (check out this video and skip to 13:30 minutes. Application: Different manufacturers apply different coating technologies on the filter in front of the sensor. These coatings can affect the stickiness of the sensor gel stick – in some cases it will be less or more sticky than in others. Because of this, we do not recommend to use the same sensor gel stick to clean different cameras, especially from different manufacturers. Please note that this particular version of the Sensor Gel Stick is for Sony Alpha and Fuji mirrorless cameras that have different sensor coating. Supported Cameras: All Sony Alpha SLT and Sony mirrorless cameras, including Sony A7, A7 II, A7R, A7R II, A7S, A7S II, A9, A6xxx, A5xxx, A3xxx and NEX-3/4/5/6/7 series. All Fuji mirrorless cameras, including: Fuji X-E-series, X-T-series, X-Pro-series, GFX 50S. All modern Leica interchangeable lens cameras. Sony A7 II, A7R II and A7S II advisory: Please be extremely careful when using the product with the A7 II, A7R II and A7S II cameras. Since the cameras have in-body stabilization, the sensor will move during cleaning. Instead of picking the Sensor Gel Stick straight up, we recommend to detach it gently from the side and be attentive during the process of cleaning, so that the IBIS system does not get moved too much. We have tested the product on the A7 II and A7R II successfully, but one must perform the procedure with extreme care on such moving sensors. If the gel sticks a bit too much, please detach it slowly from the side instead of moving it straight up, as shown in the videos. Used the Sony type Gel Stick on Fuji X-T1 and worked like a charm to get something that the blower could not dislodge. Superb. A nice dry option for completely cleaning these particular Sony sensors without issue. I have an a6000. Works like magic on the Leica M 240. I originally bought the regular blue/green one and it left an awful mess that needed a lot of wet cleaning to remove. This one as got my sensor cleaner than I’ve ever seen a sensor – like shoot a white computer screen out of focus at f22, import into photoshop and auto-tone, and there is nothing – not a spec of dust or oil. I was annoyed with very stubborn dust spots in the photos of my Sony A6300. I tried the blower, of course, but it did not work at all and only moved the spots around the frame. I considered other alternatives, but being completely new in this kind of operations, I decided to order the Sensor Gel Stick for Sony, which I estimated easier to use. It toke 3 full weeks to arrive in Italy from USA, but I was very much rewarded: 3 minutes to clean the sensor, as I saw in many youtube tutorials, and finally I could admire a photo at F22 of the sky completely clean! Wonderful and amazing. And mainly very easy. I purchased this product yesterday for my Sony A6000 and awaiting its arrival. I am interested in confirming whether the sensor gel stick for Sony cameras works on a Nikon D600 are well or does one have to purchase the “blue” sensor gel stick for a Nikon D600? Thanks in advance for your help.